As a non-smoker, how can I simulate smoking this pipe at a LARP? I just bought a nice-looking smoking pipe for use as a character prop for LARPing. 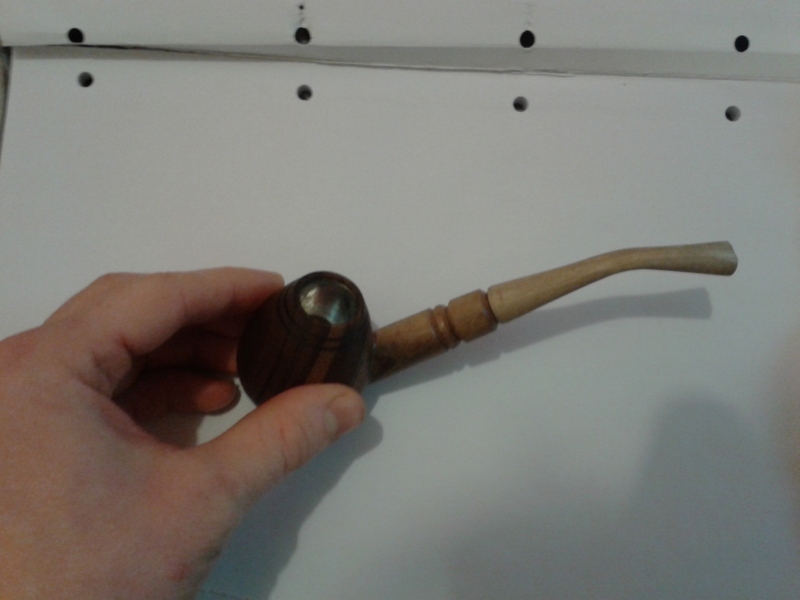 It's a working pipe and so I could use it for actually smoking tobacco in character, but I choose not to smoke, primarily for health reasons but also because (based on my experience of cigarettes) I don't like the smell or taste of burning tobacco (I am lacking experience of pipe tobacco, I am aware it is different). 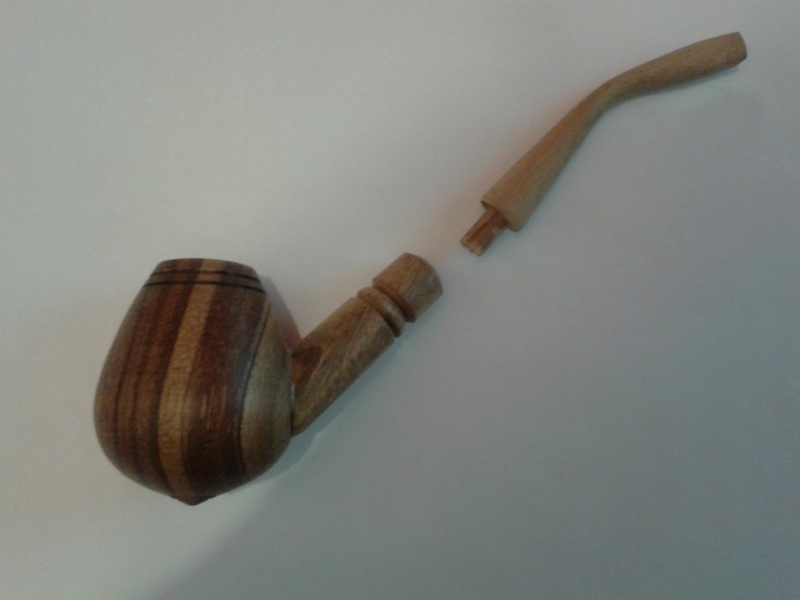 Is there a way I could modify the pipe to make it seem like I'm really smoking it, rather than constantly walking around with an unfilled, unlit pipe? The LARP venue allows smoking. There are already several players who smoke hand-rolled cigarettes to satisfy their RL addiction to nicotine, so second-hand smoke isn't an (additional) concern. Meaning that you fill and prepare your pipe as you would for actual smoking and then light it. Instead of pulling on the pipe and filling your mouth with smoke, you can simply blow gently into the mouth piece. This results in the lit tobacco glowing nicely and also a puff of smoke. Bonus: you get to meddle with your tobacco pouch and fire etc. to light your pipe like a pro. You can integrate this well into your characters quirks if you want to. Discounting 2nd-hand inhalation there should be no ill side effects except for the smell. But as you're doing this only rarely at LARPs there should be no issues. I normally just properly smoke a pipe on LARPs but I used the above technique successfully on occasion when I was not in the mood for doing so (I'm a non smoker outside LARPs). For people averse to tobaccos second hand effects (or the tobacco industry in general which they might not want to support) an alternative can be burning tea leaves - i.e. regular black or green tea that you could buy in any shop. I know people who mixed this into their cigarettes and it seemed to work out ok. You might have to pay attention not to buy the cheapest finest ground tea, as this will likely clog up your pipe, though. Note that this will still produce smoke and second hand smoking effects - simply without the nicotine. Small note, as this might be unclear: when actually smoking a pipe the smoke is not normally inhaled, but simply drawn into the mouth for the taste. This arguably makes it less unhealthy than smoking cigarettes/shisha/... as it at least doesn't affect your lungs and you're not getting a nicotine high. I have seen two methods used on stage as a stagehand, not a larp but similar limitations. Hollywood uses a substitute herb (herbal cigarette mix) that contains no nicotine. Though this stuff tends to taste foul. It also tends to smell like a different herb that might not go over well. Prop smoking cigarettes exist, you may be able to put them in a pipe with a little prop making skill. I have used the cigarettes, modifying it to a pipe would be on you. I'm guessing you have legal/personal reasons for abstaining from the most obvious tobacco alternative (although it does have an ancient, LARP-friendly lore! ), so here is another medieval-period appropriate suggestion: Mugwort. Like you, I am not a fan of tobacco, however the few times I have tried mugwort have been very pleasant. This is a classic medieval smokable with a unique flavor, and I guarantee you will feel very Gandalf with this in your pipe. Supposedly, mugwort promotes cool dreams - not sure if this is true, but if you're already roleplaying I'm sure you won't mind a placebo! Either way, this is very easy to buy online, it won't cloud your head and ruin your RP, and it's not habit forming because it doesn't have any noticeable narcotic effect. Health-wise, I couldn't find any information to suggest that smoking mugwort is any less worse for your lungs than tobacco. Particulate matter is particulate matter, no matter what plant it comes from, and I could not find information about tar content, so for all I know it could be higher than tobacco. That said, I've never heard of a 2 pack a day mugwort smoker, so you're probably fine. There are vapes designed to look like pipes, which avoids all your issues with smoking tobacco. You can use 0% Nicotine juice and don't actually inhale. For some reason, Amazon is allergic to listing them, though regular vapes and supplies are all over the place. You can use 0% nicotine juice to avoid all the bad health effects of nicotine. Sources: A bottle of vape juice that has 0% nicotine sitting on my desk. I am not affiliated with any of the links in my answer. I just found them on google. Health and Safety Note: Nothing foreign you inhale is entirely healthy, even a prescribed inhaler does some damage to the lungs. However, ejuice and vaping is concretely shown to be safer than smoking, even though it does have its own problems. However, secondhand smoke is also a safety concern, and if that was prohibitive, then OP would not be attending at all. My own experience, being someone allergic to actual cigarette smoke (I lose feeling in my lips, my eyes burn and eventually cough up blood) is that vapor from ecigs and vapes is vastly better and it doesn't noticeably bother me. I even use my own vape w no issue. For a less anecdotal answer, here is an excerpt from a webmd article on vaping. The article does cite health concerns, but like most official sites, they're allergic to doing a side-by-side comparison of vapes vs cigarettes, and they mostly focus on the cheap, convenience store varieties, due to the fact that these are less healthy and it makes a scarier story. WebMD - Is Vaping Bad For You? E-cigarettes aren't thought of as 100% safe, but most experts think they're less dangerous than cigarettes, says Neal Benowitz, MD, a nicotine researcher at the University of California at San Francisco. Cigarette smoking kills almost half a million people a year in the United States. Most of the harm comes from the thousands of chemicals that are burned and inhaled in the smoke, he explains. E-cigs don't burn, so people aren't as exposed to those toxins. A 2015 expert review from Public Health England estimated e-cigs are 95% less harmful than the real thing. Damiana is a mildly spicy herb that can be packed and smoked in a pipe. It has no psychactive properties, however some people say that it makes them feel at ease and a bit less anxious, which could also be attributed to the act of smoking. I live with a professional herbalist who does not smoke either of the big 2 (marijuana and tobacco) nor any other psychoactive herbs and regularly (once a day or less) smokes Damiana simply to enjoy and appreciate the act of smoking. I myself have not smoked anything in many years and I was at first reluctant to try damiana, concerned that it might trigger a desire to smoke tobacco. Recently I decided to try smoking some damiana. It was very nice and has not had the effect I was worried about, though I don't think I'll smoke it regularly just in case. Additionally my herbalist companion occasionally smokes a blend of dried lavender and rose which they describe as "very boojee, but absolutely delicious and satisfying." I haven't tried that particular blend but I must say, it makes any space they're in smell very pleasant. Smoking any plant matter will produce carbon monoxide and some level of tar. However occasionally smoking an herbal blend that is non-addictive will not cause any of the health problems associated with long term tobacco use. Smoking is of course a personal decision and should be made with care. If you have a local herbalist they should be able to suggest and make a blend of herbs that will fit your needs and concerns. For example, if your concern is addiction, they can blend herbs that are not addictive. Likewise if your concern is health based, an issue of flavor/smell, the way smoking feels on your throat, or something else, they can create a blend that will address your concerns. If the OP would like a specific herbal smoke blend suggestion please comment what kind of flavor/scent you would prefer and I can provide you with a blend specific to your needs. Not the answer you're looking for? Browse other questions tagged larp phys-repping or ask your own question. “Phys-repping” a large creature at a LARP? What different styles of LARP combat exist? How could I phys-rep a swarm of flying creatures? How do I safely paint a latex-coated larp weapon? How can I help inexperienced LARP crew to speak confidently? How do I promote the use of crossbows instead of bows in LARP? How do I get my players' LARP characters to not be a bunch of murderous cretins? How can I accurately capture the fun and challenge of computer hacking in a LARP? LARP Weapons on a Plane: Can you put your LARP sword in checked baggage?